For those not familiar with the Icelandic chickens they are a rare 1100-year old land race breed from Iceland. Some call them Viking chickens, or Icelandic Settlement Chickens. Those direct from Iceland call them Landnámshænsn or Landnámshænur  (which means “settlement chickens”) and also íslenskar hænur or íslenska hænsnakynið (which means “Icelandic hens/chickens”). 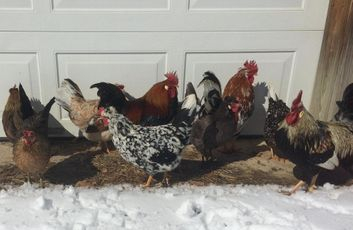 Some old timers call them Haughænsn (which means “pile chickens”) because they LOVE to free-range and dig in compost piles. The term “settlement chicken” comes from the fact that the breed was brought to Iceland by Viking seafaring settlers around the year 900 A.D. and have been isolated there with minimal mixing ever since, preserving their ancient heritage since settlement. Genetic tests have shown the breed to be substantially different from modern breeds (over 70% difference), with a great deal of unique genetic diversity. They are a true Old World heirloom treasure. It is estimated that only around 3000 birds exist world wide. The Icelandic chicken is a very hardy, healthy breed with a natural curiosity and love for foraging. The hens readily go broody and do a great job at raising their own chicks, making them an ideal backyard or homestead breed. They are generally inquisitive, fun, and friendly, but can also run circles around you and fly the fence when the mood strikes them. Size-wise, the Icelandic chicken is a well-built medium sized bird, although often on the smaller side of medium. The hens lay a generous amount of medium to large eggs that have beautiful white to cream-colored shells, and they taste great too, thanks to their extreme foraging tendency. The Icelandic chicken is generally considered to be a land race breed and as such the birds come in a wide variety of colors and several varieties of combs, although the most common comb is the single comb, followed by the rose comb, but other combs are possible. Offspring may or may not have the coloring of their parents. Their uniqueness comes from their ancient genetics, which is why birds must be kept 100% pure to be considered “Icelandic”. If they are ever mixed they can never be bred back to being Icelandic. This is why it is very important to keep track of your bloodlines if you want to raise pure Icelandics. Our flock is derived from foundation stock from Mack Hill Farm, in Missouri, Harvey Ussery, in Virginia, and David Grote of Wisconsin. We are pleased with the quality of our birds, and strive to keep and sell the best of offspring. They are a mixture of the pure lines direct from Iceland, and have proved to recreate themselves with a beautiful variety of color and feather patterns. Contact us for more information and I'm happy to send our sales policy for availability and pricing for limited quantities of hatching eggs and local pickup day old chicks.